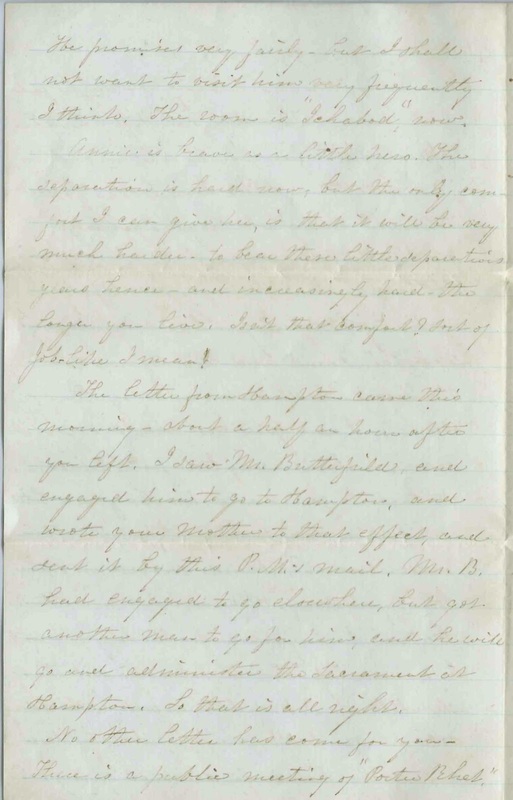 Letter written on June 8, 1865 by Anna Farrar Abbott, "Annie", at Andover, Massachusetts, to Rev. Benjamin Franklin Perkins, who was making his way to Eastport, Maine. The letter was addressed in care of a relative, David Perkins, at Eastport, Maine. 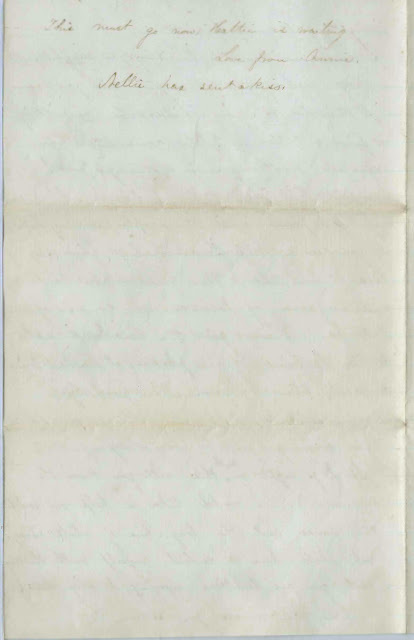 Letter and transcript at the end of this post. 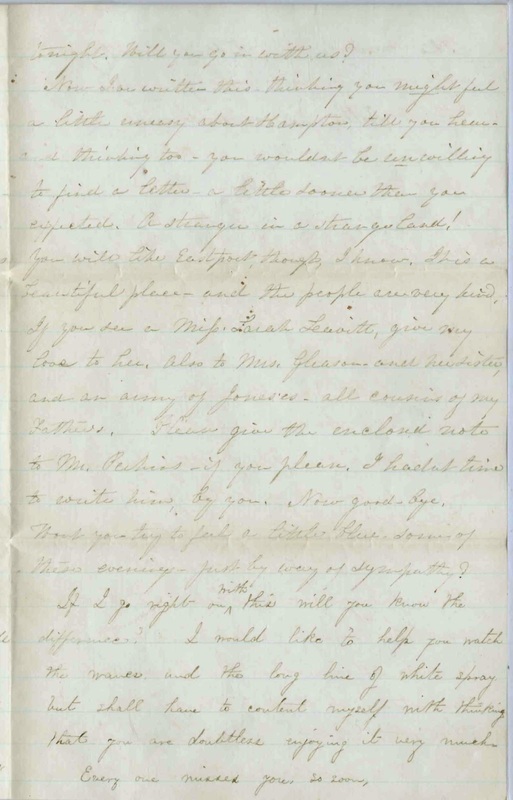 It's a lovely letter, written just after Rev. 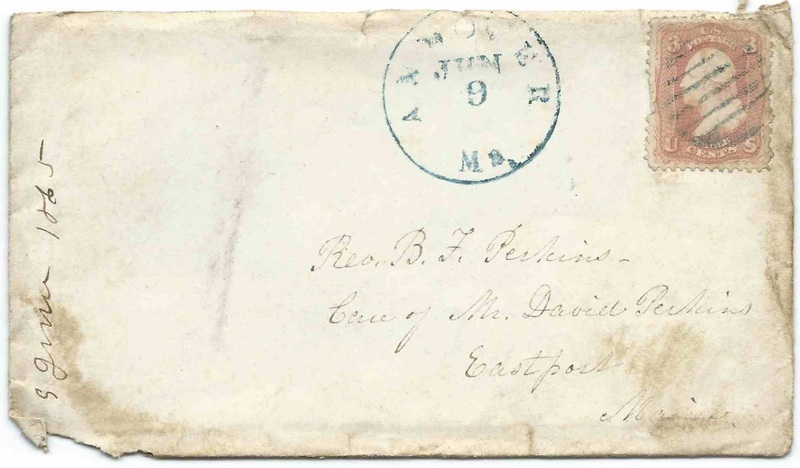 Perkins had left Andover and his "sacred room", and only a few months before his marriage to Anna at Andover on November 22, 1865, the date also of his ordination. According to Rev. Perkins' obituary in volume 44, 1912, of the Granite Monthly: a New Hampshire Magazine, the new couple then traveled to Missouri, where they were engaged in home missionary work for several years. They would return to New England for a while, before returning to the Midwest. A few years later, they would return to New England for good. 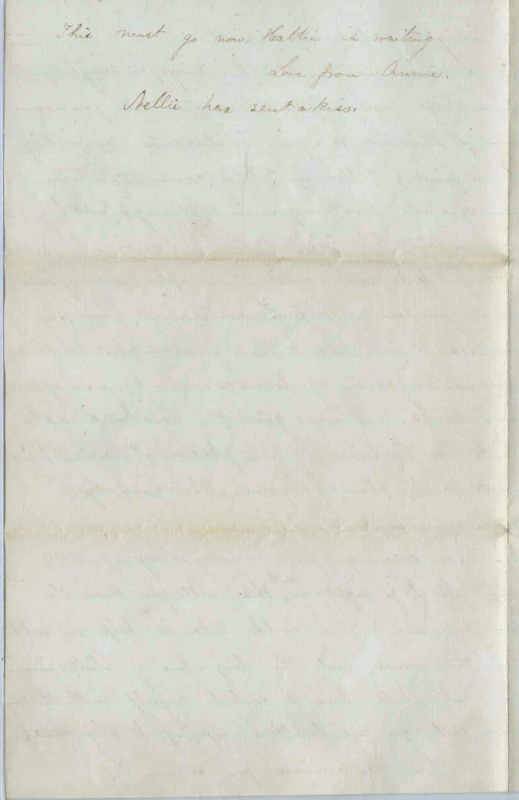 letter from Hampton, New Hampshire - possibly regarding the offer of a church? Public meeting at "Porter [Bhet ? 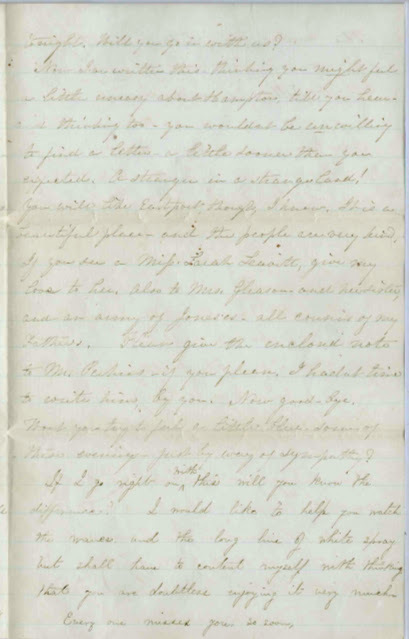 ], presumably at Andover, Massachusetts - if you can interpret this phrase from the images below and have more information on it, please leave a comment or contact me directly. She put other words and phrases in quotes, in a joking way, so this might be an inside joke between the two of them, but hopefully it's something a reader will recognize. 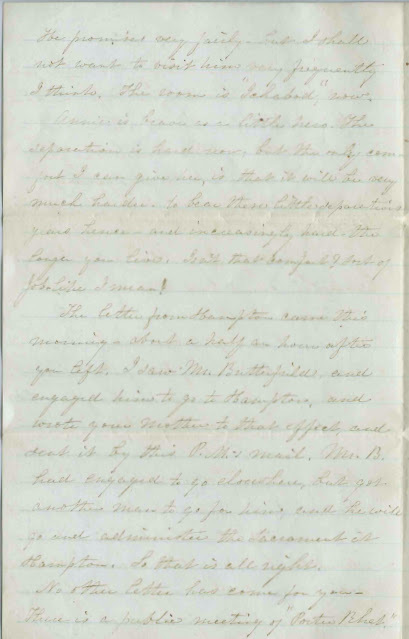 Anna Farrar Abbott was born December 1, 1844 at Seabrook, New Hampshire, the daughter of Rev. Sereno Timothy Abbott and Sarah (French) Abbott. Rev. Abbott, a native of Andover, Massachusetts, had graduated from Andover Theological Seminary in 1836. He was a minister at Seabrook, New Hampshire, until his death in 1855. 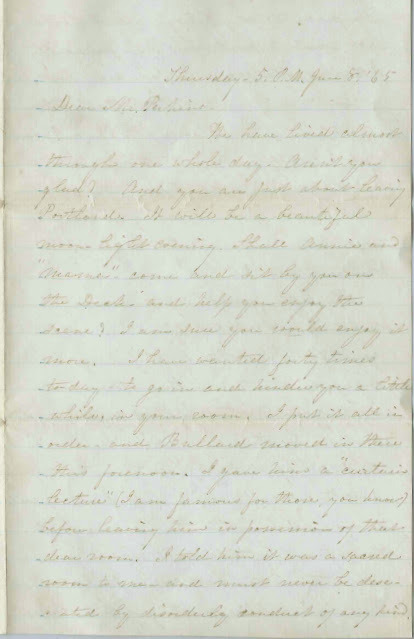 His widow, Sarah (French) Abbott, then moved her family to Andover, Massachusetts. Rev. Benjamin Franklin Perkins was born at Hampton, New Hampshire, on February 22, 1834, son of Deacon James and Ruth (Johnson) Perkins. Rev. 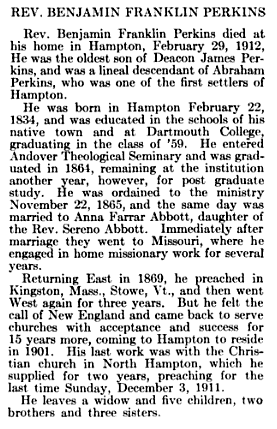 Perkins graduated from Kimball Union Academy at Meriden, New Hampshire; Dartmouth College at Hanover, New Hampshire, in 1859 and Andover Theological Seminary in 1864. He stayed on at Andover for another year, in order to receive a resident licentiate, which perhaps he had just achieved in the days before his departure from Andover, as described in this letter. Rev. Benjamin Franklin Perkins died on February 29, 1912 at Hampton, New Hampshire; Anna Farrar (Abbott) Perkins on April 18, 1936 at Cambridge, Massachusetts. If you have corrections and/or additions to the information above, please leave a comment or contact me directly. We have lived almost through one whole day. Aren't you glad? And you are just about leaving Portland. It will be a beautiful moon light evening. Shall Annie and "Mama" come and sit by you on the Deck and help you enjoy the scene? I am sure you would enjoy it more. I have wanted forty times today to go in and hinder you a little while in your room. I put it all in order and Ballard moved in there this forenoon. I gave him a "curtain lecture" ( I am famous for those, you know) before leaving him in possession of that dear room. I told him it was a sacred room to me and must never be desecrated by disorderly conduct of any kind. He promised very fairly - but I shall not want to visit him very frequently I think. The room is "Ichabod" now. Annie is brave as a little hero. The separation is hard now, but the only comfort I can give her, is that it will be very much harder to bear these little separations years hence and increasingly hard the longer you live. Isn't that comfort? Sort of Job-like, I mean. The letter from Hampton came this morning - about a half an hour after you left. I saw Mr. Butterfield and engaged him to go to Hampton, and wrote your Mother to that effect, and sent it by this P.M.'s mail. Mr. B. had engaged to go elsewhere, but got another man to go for him, and he will go and administer the Sacrament at Hampton. So that is all right. No other letter has come for you. There is a public meeting of "Porter [Bhet?] tonight. Will you go in with us? Now I've written this thinking you might feel a little uneasy about Hampton, till you hear - and thinking too - you wouldn't be unwilling to find a letter a little sooner than you expected. A stranger in a strange land! You will like Eastport, though, I know. It is a beautiful place - and the people are very kind. If you see a Miss Sarah Leavitt, give my love to her. Also to Mrs. Gleason and her sister, and an army of Jones'es - all cousins of my Father. Please give the enclosed note to Mr. Perkins if you please. I hadn't time to write him, by you. Now good-bye. Won't you try to feel a little blue - some of this evening - just by way of sympathy? If I go right on with this, will you know the difference? I would like to help you watch the waves and the long line of white spray but shall have to content myself with thinking that you are doubtless enjoying it very much. This must go now. Hattie is waiting. Nellie has sent a kiss.